Vampires are a pop culture phenomenon that are forever changing the way we perceive vampires all year round, and not just for Halloween. 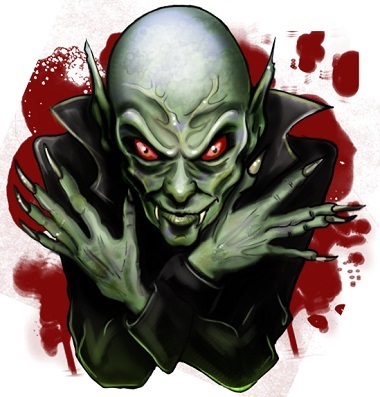 Slots have themes to separate themselves from one another, and this slots theme is one of vampirism that takes a friendlier approach in demonstrating their theme. NetEnt are the developers for this slot, and have clearly been paying attention to the lore behind vampirism. If players are looking for blood and a certain romance, then they will not leave disappointed. 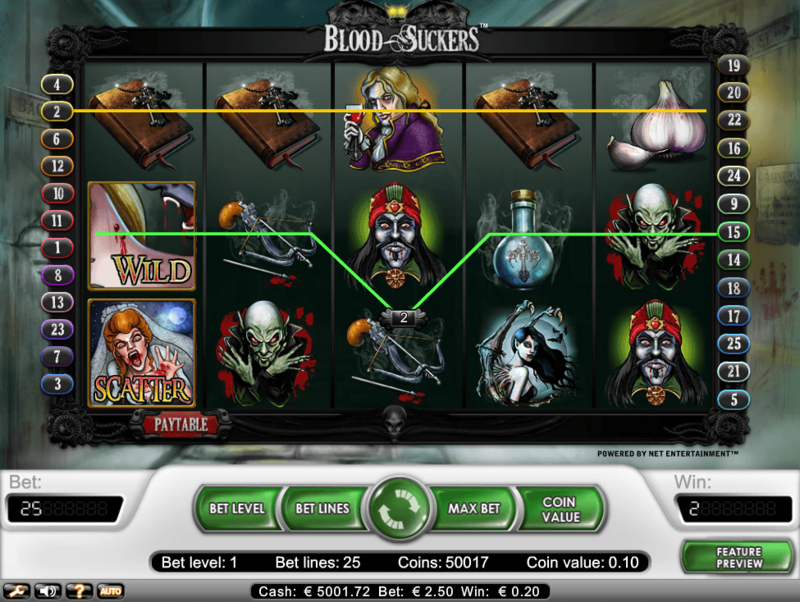 Bloodsuckers is a 5 reel by 25 pay-line slot that is clearly catered to a younger audience, although if you enjoy a slot with a great theme then age shouldn’t matter in this regard. Bloodsuckers is compatible on multiple systems, including: Windows, Mac, and Linux. NetEnt (short for Net Entertainment) are known not only for their highly anticipated online slots and games, but also for their pioneering attitude towards the industry itself. They lead by example with cutting edge titles such as Butterfly Staxx and Gonzo’s Quest. You can read more about the developers other games here on Easy Slots online casino. There are a lot of different features that make up the Bloodsuckers experience. Scatter wins, free spins and wilds make up the basic features one can experience here. 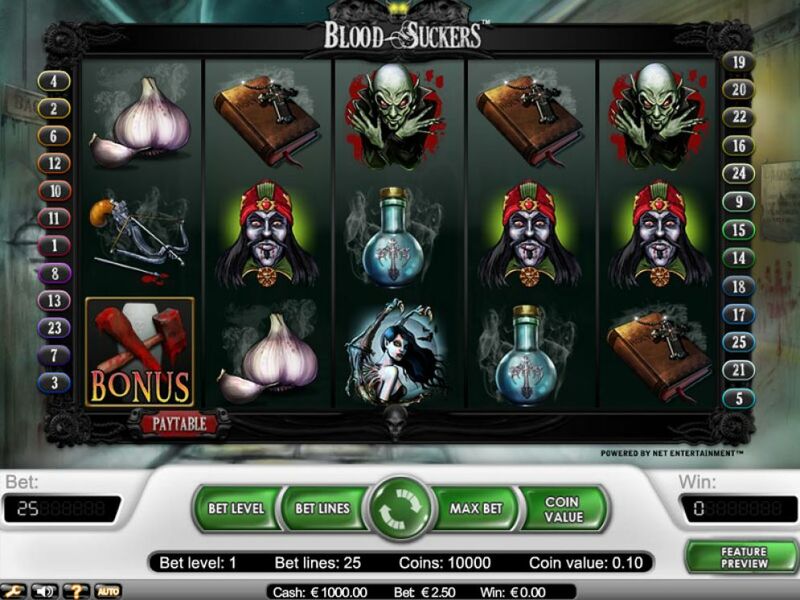 The Bloodsuckers slot also features a vampire slaying mini game that allows players to boost their base scores even higher, while also adding on the fun. Wild symbols in Bloodsuckers operate in the same way they would in most online slots: substituting symbols for scatters that in turn can push you even higher up that scoreboard. Matching 3 or more of the scatter symbols on any of the reels will grant you 10 free spins where your winnings are tripled in this feature exclusively. In other words, aim for those scatters! In order to activate the aforementioned vampire slayer feature, players must match the bonus symbol on the reels. From there, you are handed a hammer and stake and it is up to you to put an end to some of the most feared vampires, once and for all. This feature will transport you to another setting, one that is a lot darker and has a rather ominous presence about it. The room you are taken to is full of coffins. From this point it is up to the player to open the coffins to discover the vampires. Finding 3 empty coffins will end this mini game and you will be taken back to your original setting (which could be a good thing depending on how scared you are). This feature is a great incentive for players to spin multiple reels, trust us. Bloodsuckers: a unique take on the vampire genre as a whole. What NetEnt have managed to achieve here is very much in line with the reputation they have in the online gaming industry. When we think vampires we now think of Bloodsuckers thanks to simply playing this slot for ourselves. Players who enjoy dark and moody visuals over a rather fun slot will no doubt find some fun here. 8/10.